The reader's companion to a visual dictionary, The Name Book tells you what something is called, and helps you think of what to call it. What's in a name? Just about everything. And nothing is so sweet and marvelous as this ingenious new reference, which gathers thousands upon thousands of names for all manner of objects, creatures, places, people, sports, cars, brands, and much, much more. The Name Book is two great, and much-needed, books in one. 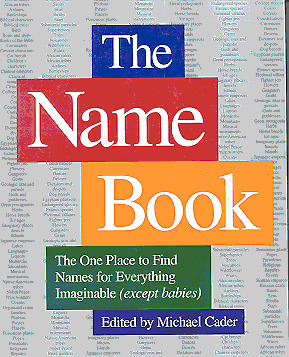 On the one hand, it is a comprehensive brainstorming, thought-inspiring book for naming absolutely anything and everything except for babies (and, to tell the truth, it even helps there). So for all those things we put our stamp on every day — boats, pets, even book titles, plus all manner of slogans, pitches, headlines, product names, and nicknames — this volume inspires and leads like no other. On the other hand, it's a great one-stop reference book for finding the names of all manner of things without having a library full of specialized references. For all the times you had the name of something on the tip of your tongue (the horse with splotches on it, or the pope who had children, or what they use to call Zimbabwe) or needed to find a particular name for something but had no idea where to look, this is the book — complete with the names of practically everything you've ever wondered about, plus a whole lot of others you didn't even know you were looking for. The reader's companion to a visual dictionary, The Name Book tells you what it's called, and helps you think of what to call it.